Need an escape from the everyday stresses of life? For a weekend of pure relaxation, our spa breaks offer the perfect tranquil atmosphere. Zone out, unwind and get ready to be pampered. At the Bedford Lodge Hotel & Spa in Newmarket, Suffolk, we have a range of luxury spa breaks, from our popular ‘Couples Retreat’ spa break to our ‘Spa Sunday’ spa break, perfect for couples who want to relax and spend some quality time together. Our Suffolk spa offers top of the range facilities, including an impressive hydrotherapy pool with five different water experiences, an outdoor rooftop hot tub, mud rasul for cleansing mud treatments and thermal area with a hammam table, perfect for relaxing and easing tension in your muscles. As well as this range of spa experiences we also have our spa lounge and decadent relaxation room. Offering areas to kick back with a magazine or book, or simply shut your eyes and let your mind drift away. With soft blankets, comfortable sofas and soft lighting, it’s not hard to unwind in this luxurious setting. After a day’s relaxation, tuck into a delicious three course dinner in our 2 AA rosette, award winning Squires restaurant. Just make sure you save room for dessert! Once you’ve finally torn yourself away from a day of bliss, slide into more luxury at our Four Red Star Hotel, making it the ultimate spa break. 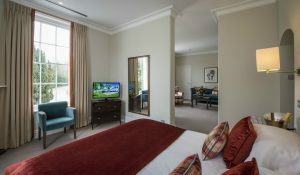 Our chic hotel rooms offer pure luxury, and a great night’s sleep! We have various room options for you to choose from, including king bedrooms to luxurious executive suites. We also have an on site Health & Fitness Club which is complimentary to all of our hotel guests. And in the morning, it’s time to enjoy an delicious breakfast! Feast on pastries, cereals or perhaps a full English will take your fancy.